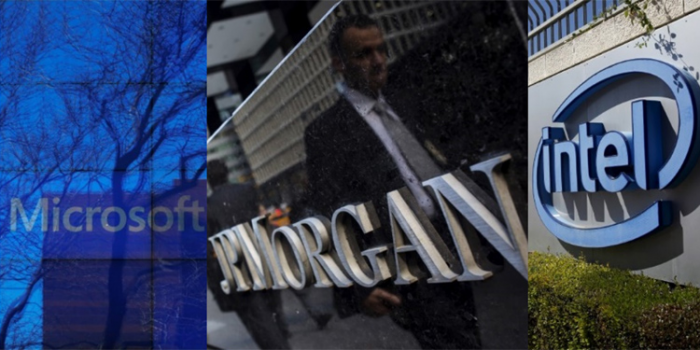 NEW YORK (Reuters) – JPMorgan Chase, Microsoft, Intel and more than two dozen other companies have teamed up to develop standards and technology to make it easier for enterprises to use blockchain code Ethereum in the latest push by large firms to move toward distributed ledger systems. The Enterprise Ethereum Alliance (EEA) will work to enhance the privacy, security and scalability of the Ethereum blockchain, making it better suited to business applications, according to the founding companies, which said they plan to announce the initiative on Tuesday. The EEA joins a growing list of joint initiatives by large companies aiming to take advantage of blockchain, a shared digital record of transactions that is maintained by a network of computers rather than a centralized authority. About 70 financial firms are involved with a R3 CEV, a New York-based startup focused on developing blockchain technology for the finance industry, while technology firms such as IBM and Hitachit are part of the Hyperledger Project, a group led by the Linux Foundation. The EEA underscores the enthusiasm around the nascent technology, but also highlights some of the hurdles that companies must still overcome before they can deploy blockchain on a large scale. This includes ensuring that the technology can support the vast number of transactions processed by large corporations, while being secure enough to meet their stringent security standards. Ethereum, a type of blockchain that can be used to develop decentralized applications, was invented by 23-year-old programer Vitalik Buterin. Several banks have already adapted Ethereum to develop and test blockchain trading applications. Alex Batlin, global blockchain lead at BNY Mellon, one of the companies on the EEA board, said over the past few years banks and other enterprises have increased collaboration with the Ethereum development community, facilitating the creation of the EEA. "There is a lot more synergy in thinking than was ever possible before," Batlin said. The EEA will collaborate with the non-profit foundation that promotes the development of Ethereum, the companies said.